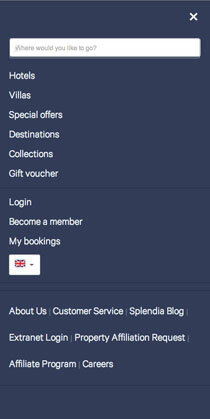 Splendia, the famous Luxury Hotels Online Travel Agent, has released today his new Responsive Web Design. Splendia.com provides a curated selection of exceptional hotels offering high quality of services by traveling around the world. “First of all, I’d like to thanks Esario’s team for helping us in the process of revamping our website as much as optimizing our SERP for the past 4 years. To try to be short, I would say that a responsive design consists of 3 different web design enabling to offer a comfortable reading and navigation of a website on any type of device: Mobile, tablets & desktops. Considering that a smartphone or a tablet user has 2 ways of navigating a website depending on way he holds his screen (Portrait or Landscape), we first started by making several schema/sketches simulating different navigation pattern on 3 screen sizes for better consistency. Splendia provides a curated selection of exceptional hotels offering high quality of services by traveling around the world. Founder & co-owner at Esario. ¿Cómo aumentar el tráfico de tu web de hoteles en Google?